Thank you for your interest in Thompson Floor. We are a licensed and bonded contractor in Seattle specializing in polished concrete flooring. We’ve been in business for over twenty-five years providing floor care services to commercial customers. During our work in the floor care industry over the years, we became aware of polished concrete floors and were impressed with its advantages compared to traditional finishes. 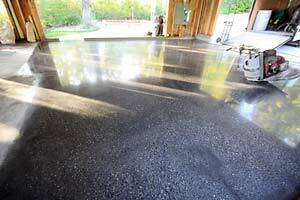 We learned the craft and became involved in the exciting new industry of concrete polishing. We pride ourselves on paying attention to each customer’s particular requirements and being able to provide the exact set of services they need. We take special care in protecting your home or business and will leave your site with only a beautiful floor to show that we’ve been there. We use state-of-the-art concrete polishing equipment and are serious about our work; we think you'll like the results.